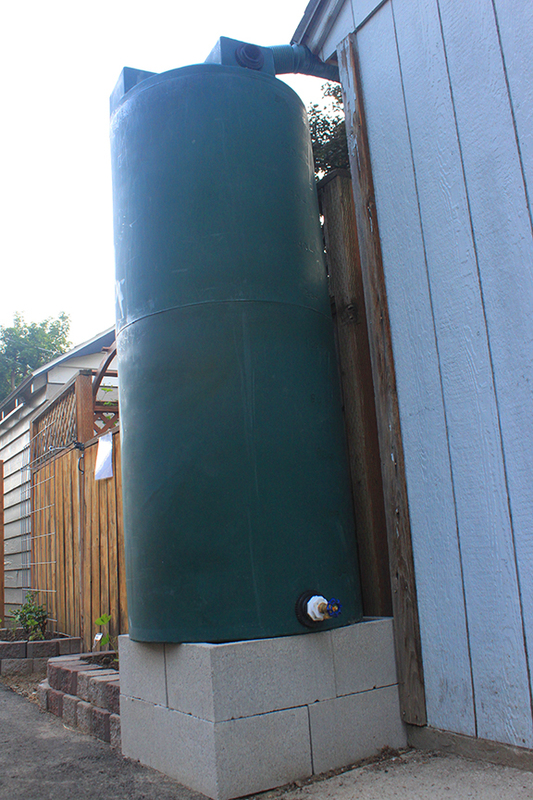 now that’s a rain barrel! Here in the high dessert of Idaho, it doesn’t rain a lot so when it does, I want to make sure and capture as much of it as possible. Especially when the two barrels we are installing as part of the alley project will be for the use of anyone in the block to water the edible garden that’s being installed. So in other words, size mattered. My brother had sourced one of these 210 gallon barrels for my backyard a few years back from Custom Roto-Molding. Just a few other supplies and this project goes together in a flash. I know it’s tempting to just throw the blocks down, plop the barrel on top and call it a day, but if we’re going to do this, let’s do it right so that we have something that not only looks good but functions well too. Start by leveling the ground and tamping it down to make a base. Next layer the blocks in two rows altering the direction of them for added stability. Having the water tank up on blocks allows for a hose to be used or is the perfect height to fill a watering can. Redirect the gutter so that the water will flow to the rain barrel. Your gutter configuration will dictate what pieces you need to make this happen. In this case we were lucky enough to just remove the end cap from the existing gutter and use a piece of flexible gutter material for the redirect. To trap any debris, we just used a plastic colander from the dollar store. 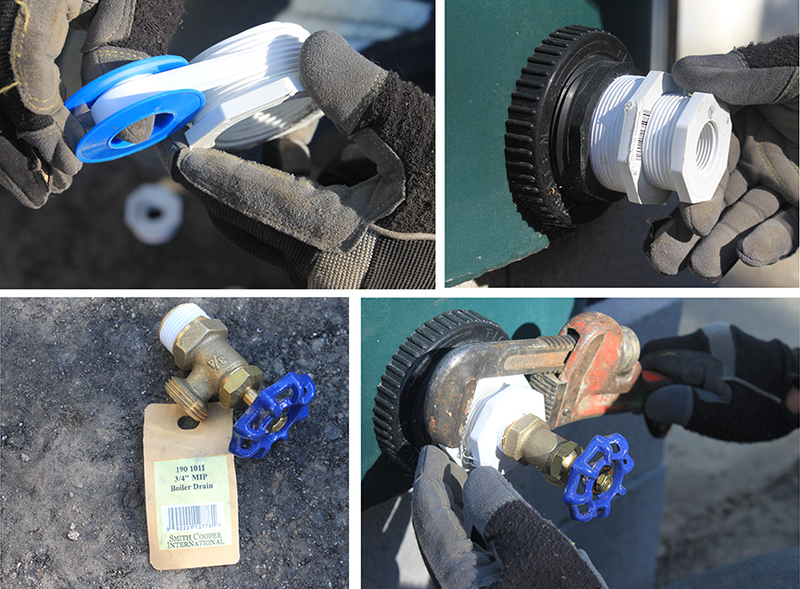 The outlet in the tank we had was 2″ so we used a reducer to size it down for our 3/4˝ faucet. Use plumbers tape for a little extra insurance for a tight fitting that won’t leak. Now hope that you get a big rain storm to fill that baby up! 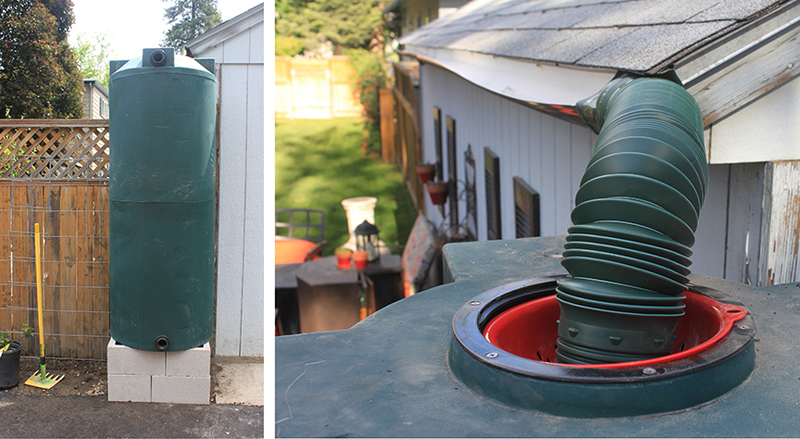 TIP: For colder climates, in the fall make sure to drain the rain barrel, and seal the top with the lid. Leave the drain open so if any moisture does get in that it will run out. Aha! I’ve been looking for one of these for YEARS. Bingo. I’ll be getting one ASAP. Thanks for the great resource. Glad I could help! And it’s great that the place is so close by. You might mention that you heard about them from the alley project as he did discount our barrels a little to help contribute to the project. All about showing our sponsors some love. Thanks and have a great day! Can do, will do, thank you!